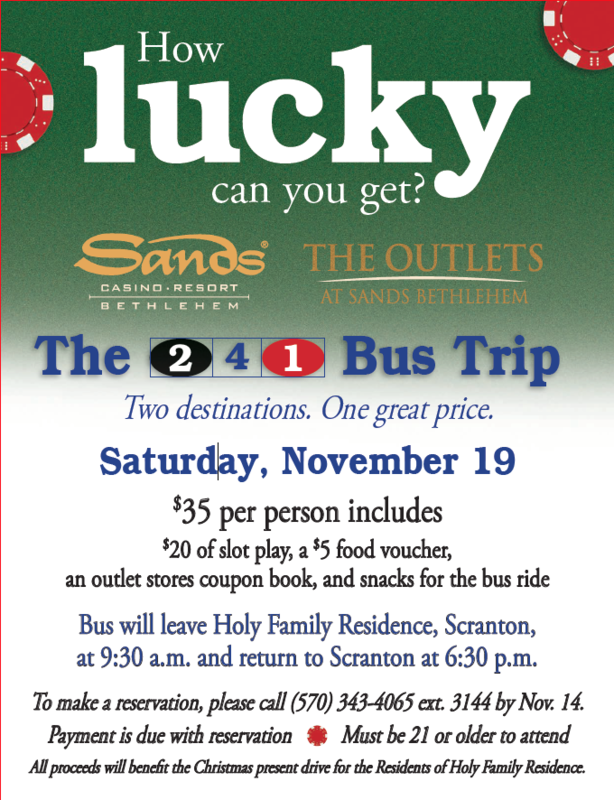 The members of the Association Jeanne Jugan of Holy Family Residence will sponsor a bus trip to the Sands Casino and Outlet Shopping complex, Bethlehem, on Saturday, Nov. 19. The bus will leave the parking lot of the residence, 2500 Adams Ave., Scranton, at 9:30 a.m. and return to the residence at 6:30 p.m. All bus ticket proceeds will be donated to the Little Sisters of the Poor to purchase Christmas gifts for the Residents of Holy Family Residence. Bus tickets are $35 which includes $20 of slot play, a $5 food voucher, a coupon book for the outlet stores, and snacks for the bus ride. To make a reservation please call (570) 343-4065 ext. 3144 by November 14. Attendees must be 21 or older to attend. Valid photo ID required.